Defective products injure thousands of consumers every year. These products are used at the office, at home or on vacation. Sometimes those injuries are preventable, products of operator error, but more often than not, these injuries occur because the product itself is defectively and unreasonably dangerous. From trucks to snowmobiles, stoves to medical equipment or medications, defective products can cause serious and sometimes catastrophic injury or death. 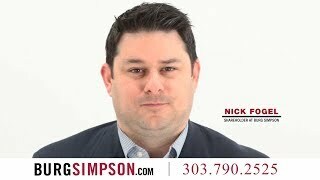 The Denver personal injury attorneys at Burg Simpson are here to help you. Call us right now today at 303-792-5995 or fill out a Free Case Evaluation form here if you’ve been injured because of a dangerous product. WHAT KINDS OF PRODUCTS CAN BE DEFECTIVE? Pharmaceuticals: Roughly 170 million Americans take prescription medications on a regular basis. Despite exhaustive testing protocols and Federal Drug Administration regulation, properly prescribed medicines lead to nearly 2 million hospitalizations every year, killing 128,000 annually. That puts prescriptions drugs as the No. 4 cause of death in the United States. Newer drugs are particularly risky, with one in five new prescription drugs leading to a serious reaction after FDA approval. Medical Devices: Every year, thousands of reports of deaths and serious injuries from medical devices flood into the FDA. As the industry itself has seen unprecedented growth, the number of injuries and deaths as a results of these devices has skyrocketed, as well. Motor Vehicles: Since Congress passed the National Traffic and Motor Vehicle Safety Act in 1966, more than 390 million vehicles have been recalled over safety issues. Recalls have ramped up over the past few years, hitting a peak in 2015, when nearly 870 separate recalls pulled more than 51 million vehicles off the road. If you or a family member have been hurt by a defective product, don’t hesitate to reach out to the Colorado personal injury attorneys at Burg Simpson by calling 303-792-5595 before it’s too late! Defects come in a few different shapes and sizes. They can come in the form of bad product design or shoddy manufacturing. A product can also be defective and unreasonably dangerous if it’s marketed and sold without adequate warning about the product’s dangers. Design defects: These defects arise when a manufacturer designs a product that fails to eliminate – or in fact creates – an inherent danger in the product. Design defect claims occur regardless of whether the product was manufactured according to the design specifications. Motor vehicles, recreational equipment, consumer products, pharmaceuticals, and heavy equipment, are just a few of the products that hit the market with a design defect. Design defects frequently lead to a safety recall of the defective products by the manufacturer or government regulators. Manufacturing defects: These flaws are a result of the manufacturing process. Manufacturing defects typically affect just a few of the company’s products, but they can also be more prevalent in some instances. For example, a food processing plant that fails to properly clean or maintain its equipment can be held liable for contaminating a product – such as ice cream, juice, or produce – with deadly bacteria. Another example is a manufacturer who’s liable for a product failure when it improperly fabricates materials during a production run, creating a dangerous critical unseen weakness in the final product. Failure-to-warn defects: Manufacturers and sellers can also be held liable when they fail to warn buyers, end users, and consumers that their products have certain dangers. These failure-to-warn defects against dangers can cause a product to be unreasonably dangerous. Consumers have grown accustomed to seeing warnings on all kinds of products sitting on store shelves. Vehicles, recreational equipment, baby products, toys, pharmaceuticals, and other consumer products pose dangers that can lead to serious injury or death. Most manufacturers and sellers try to warn consumers about their products’ dangers. However, sometimes they fall short. When they do, they can be liable for injury or death caused by that failure to warn. If any of these product defects injured you or someone you love, reach out to the Denver personal injury lawyers at Burg Simpson as soon as possible at 303-792-5595 to discuss your case with us for FREE. Economic Losses, which include past and future medical and rehabilitation expenses, lost income, loss of earning capacity, and out-of-pocket costs. Non-Economic Losses, which include pain and suffering, loss of enjoyment of life, mental and emotional distress, inconvenience. WHAT SHOULD YOU DO IF YOU OR A LOVED ONE HAS BEEN INJURED OR BEEN KILLED BY A PRODUCT? After getting medical attention, you should immediately get in touch with a personal injury lawyer experienced in handling defective product liability/defective product claims. Many states have special laws governing product liability lawsuits and they could limit your rights and make bringing claims for injuries against a product manufacturer difficult. Most importantly, the time you have to file such a claim is limited. The corporations that manufacture these products often have significant resources—money and lawyers—to protect themselves. That’s why it’s important for you, the consumer, to reach out to a law firm that has the experience and resources available to fight back against these corporations. You need someone on your side to help make sure your rights are protected. The family of a person killed by a product may be able to bring a wrongful death claim and recover economic and non-economic damages. If this has happened to someone you love, call our personal injury lawyers in Denver now at 303-792-5595. 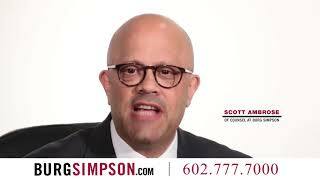 WHAT KINDS OF PRODUCT LIABILITY CASES DOES BURG SIMPSON HANDLE? Our lawyers have handled product liability cases involving serious injury or death for over four decades. We’re committed to helping victims seek compensation for injuries caused by the fault or negligence that lead to a defective product making it to the marketplace. Our experienced lawyers have helped thousands of persons suffering from serious personal injuries, and the families of those who’ve lost their lives to defective products, rebuild their lives. We have the experience and resources to help you navigate the many legal issues that surround product liability claims, including causation investigation, expert retention and evaluation of product defects, medical injury investigation, damages issues, insurance claims, settlement negotiations, and, if necessary, litigating in court against persons and companies who won’t take responsibility. 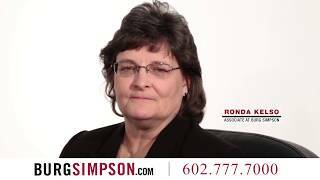 Our Denver personal injury attorneys at Burg Simpson are known for our work in product liability. In fact, Burg Simpson has been ranked No. 1 on the Martindale-Hubbell Top Ten Law Firms for Product Liability. Let us help you fight for your rights. Call us today at 303-792-5595 or fill out our FREE CASE EVALUATION FORM right now to speak with a personal injury attorney before time runs out.